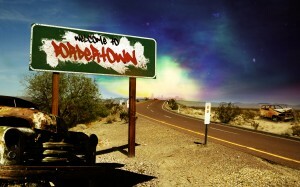 Holy cats, the designs I created for Bordertownseries.com made it to BoingBoing, thanks to Cory Doctorow & Ellen Kushner. I was not expecting that. But it’s kinda nifty. The swag itself is up in my Cafepress Shop. If you'd like to learn more about the design process, I've created a Tumblr and have been posting bits about the projects I've been up to there. What is a "Web Piskie" you ask? In my case, being the B-town Web Piskie means that I am in charge of updating Bordertownseries.com, and also the brand-spanking-new B-town Tumblr. I am relatively new to the world of Tumblr, this I admit. But part of the joy of the last few days has been surfing #Bordertown tagged content, and finding all the fan comments on both Welcome to Bordertown and The Bordertown Series, created by Terri Windling. Keep spreading the love! 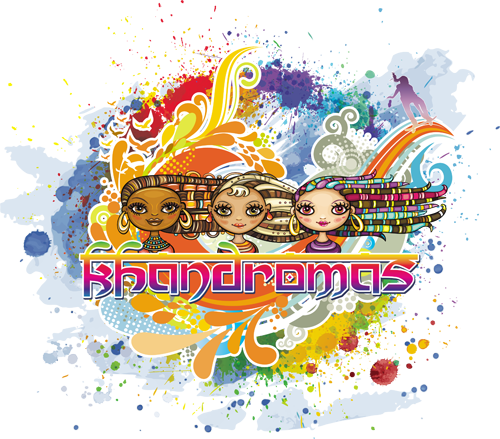 And if you have a tumblr, please follow the B-Town Blog, and feel free to reblog! Think of us as noobs with the dust of the world still fresh behind our ears. We need some Diggers to show us the Way around town. In the meantime, keep checking Bordertownseries.com as we're adding content practically daily, and I'm sprucing the place up with new pretties all the time. Soon Trader's Heaven will be jam packed with new B-town swag (I cannot tell you how long I have wanted a Khandromas tee-shirt, and how thrilled I am that I will soon be able to have one of my very own), new extras like desktop wallpaper and icons, and the Bring a Friend to Bordertown contest is well udnerway, with some AMAZING entries thus far! FIVE exciting things to announce today! Seanan McGuire has posted new Incryptid stories featuring Frances Brown & Jonathan Healy, and I designed the covers. Please check them out! I've entered four tee-shirt designs in WeLoveFine's JEM design contest. The winner gets to have her or his design produced as a tee-shirt (and officially licensed by Hasbro!) in addition to a cash prize. You have to register on the site to rate the designs, and the more folks who rate them, the higher the potential cash prize. So if you have a minute, and want to indulge my passion for frighteningly PINK glamour & glitter, fashion & fame, check it out! Secondly, Welcome to Bordertown comes out in trade today!!! BordertownSeries.com has been redesigned (by yours truly), and editors Ellen Kushner and Holly Black are running a contest! Thirdly, Chicks Dig Comics hits stores today, featuring an essay by me, and essays and interviews from a SLEW of amazing contributors. It's edited by Sigrid Ellis and Lynne Thomas and the official book launch will be at C2E2 this Sunday! And lastly, Seanan McGuire's album Wicked Girls has been nominated for a Hugo Award in the "Best Related Work" category. I designed the cover, and could not be more thrilled that it has made it to the Hugos Ballot. As many before me have done, here is my WorldCon Schedule as it currently stands! Hope to see many of you at Renovation‏ next month. TV's cross between X-Files and The Twilight Zone just keeps getting richer and stranger. It's got a great mad scientist and a hot FBI agent or two. Where is Fringe going? Why do we love it so? Should an e-book cover be different than a print book? Does it have to be standard book cover size and shape or can it slip loose of standard print constraints? How the market for cover art and design might change in the age of electronic publishing? Get your doll-geek on! There aren't enough action figures of female characters from film or literature, but you can make your own! Come learn how to transform fashion dolls to geek chick icons. A review of the process and challenges involved in designing and producing a book once the written word is in hand. The Doctor's companions aren't just generic side kicks. Our view of the Doctor is influenced by his companions. And the companions change the Doctor, something examined a number of times over the last several seasons. Dr. Who has been a very popular show for generations. But is the new Dr. Who losing its way? Is bigger and younger always better? Is there a method to Moffat's madness? Since Season Six won't conclude until after Worldcon, speculations can abound! Does web site design still matter in the age of social media? How should a nontechnical artist or author approach the question of how to market yourself electronically?